For lovers of African landscapes and for the pleasant nature recreation, this tour will be a real treasure. 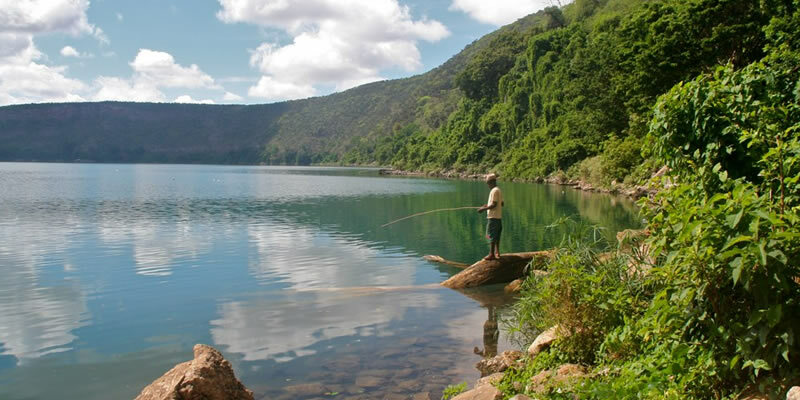 Early in the morning you will make a transfer to Lake Chala and will be on its shore. The pond is located on the border between Tanzania and Kenya and it was formed as a result of the movement of tectonic plates, so it is situated in the low place and has high banks, resembling the crater. Upon arrival at the location, you can make panoramic photos from Lake Chala lodge viewing platform, then you will go down to the shore. The transition is the easy half-hour trekking along the shore of the lake. Going down, you can swim or take a canoe (kayak) to sail away from the shore and look at all this beauty. Toward the middle of the day you will be given lunch-boxes and you can have dinner. There are no time limits, so you can rest here until the darkness and see the lake in the rays of the setting sun. In the morning your guide will pick you up from your accommodation. You will drive to Lake Chala with a packed lunch box and drinking water. Upon arrival you will see the beautiful private game reserve overlooking the Crater Lake. Our guide will take you down to the lake. Spend the day swimming, exploring, kayaking (optional). You will experience the natural beauties of the green scenery, landscape and will also have the opportunity to meet local people doing their daily activity. There is a very high possibility of spotting the baboon monkey, velvet monkey, blue monkey, antelopes, elephants and many different birds, that live in this wonderful savannah land. You will then be driven back to Moshi in the late afternoon. There is also the option of staying overnight in the lodge or camping site. If you are camping, you can either bring your own equipment or hire upon arrival. There is a bar that serves alcoholic and non-alcoholic beverages and a restaurant that serves snacks and main meals. Staying overnight gives you the opportunity of going on longer hikes, fishing, and having time to relax next to a camp fire.